JustBreathe It’s Time to Act if we Want to Save our Coastlines! Imagine you’re enjoying a Mai Tai in Bali, in awe of the natural beauty of its clean water and white sand. You close your eyes and you can hear the birds singing along with the relaxing tones of the ocean making it the perfect soundtrack of your dream holiday. 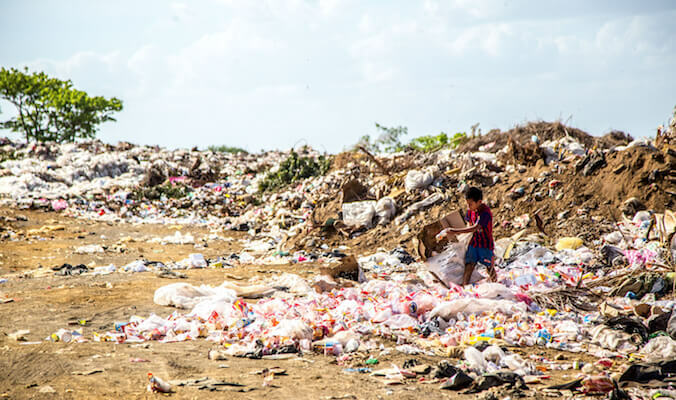 Now think you’ve saved a few pennies to accomplish that goal and, as you have enough cash to afford it, you jump on a plane to paradise and now that you’ve arrived to your destination, you’ve landed on a stinky plastic landfill called Bali. The world is changing and we need to change too. Scientists estimate that almost 8 million tons of plastic debris is being washed into the ocean each year, i.e. the equivalent to “five grocery bags filled with plastic for every coastline in the world” (Jambeck, 2015). But this is not news, in fact, it’s not news at all that the world’s oceans are being filled with enough plastic waste to thickly line every coastline. Research released in 2013 found there were more than 5 tn pieces of plastic floating on the world’s oceans damaging the eco-system of plenty of species and, despite plastic can break down in warm waters, the process releases toxic chemicals that may be digested by fish which can result in malnutrition or starvation for the fish and end up in the human food chain. The nightmare doesn’t stop there. According to The Guardian, just 5% of plastics are recycled effectively whilst a third of the plastics consumed end up in our oceans and, even though much of the remainder is burned to generate energy, this is used to make new plastic goods like bags, cups and tubs which take at least 450 years to biodegrade. By 2025 the annual input would be about twice these figure, which means 10 bags full of plastic per foot of coastline and, according to WWF, by 2050 there could be more plastic in the sea than fish. Plastic packaging doesn’t biodegrade, it just sits in landfills and represents a significant source of waste that ends up being eaten by numerous marine and land animals, to fatal consequences. If this wasn’t enough, research shows that microscopic plastic particles are present in the air at various locations throughout the world, so if you don’t care much about ocean pollution (which I think you should) rest assured that you can find plastic in the air you’re breathing. What can we do to end this? The first answer to that question is RECYCLE and RECYCLE WELL! 1) Some plastic products cannot be recycled, so make sure you check the packaging before you chuck it in the bin. If it cannot be recycled, try reusing it or turning into something crafty. 2) Some recycling centers won’t accept bottle lids because they are usually made of a different type of plastic that the bottle is made of, which may result in contamination. 3) Make sure your bottle is clean before you put it in the recycling bin. 4) Unless you’re certain that your recycling center accepts plastic seals, remove the label to avoid contamination. Another way to reduce human impact in the eco-system is avoid buying produce that is wrapped with plastic. Do you really need an extra bag for your bananas, avocados, broccoli, carrots, garlic or onions? Supermarket chains have implemented this practice for a while, despite receiving several customer complaints. In spite of the fact that plastic-wrapped products are cheaper, the plastic they use are usually not recyclable and direct contact with it can also harm your health due to all the toxic particles contaminating the food. Try going eco when you buy clothes. The clothing industry is trying to be more responsible with their products by using materials and technologies that turn plastic into fabrics, which is the case with brands like OHMME that, due to their commitment towards sustainability, they explore different techniques to reduce the negative impact the textile industry causes. Some products of their range include materials like recycled polyester, which is made of re-formed polymers, gathered from post-consumer plastic bottles or post-industrial manufacturing packaging. Recycling polyester consumes less energy than producing virgin polyester and keeps bottles and other plastics out of the landfills, and ocean gyres reducing the amount of plastic found in our environment. If you can at least convince one person to reduce the amount of plastic they use, you’ve done your bit. Remember, we all have the power to make a difference and it’s better if you do little than nothing at all.